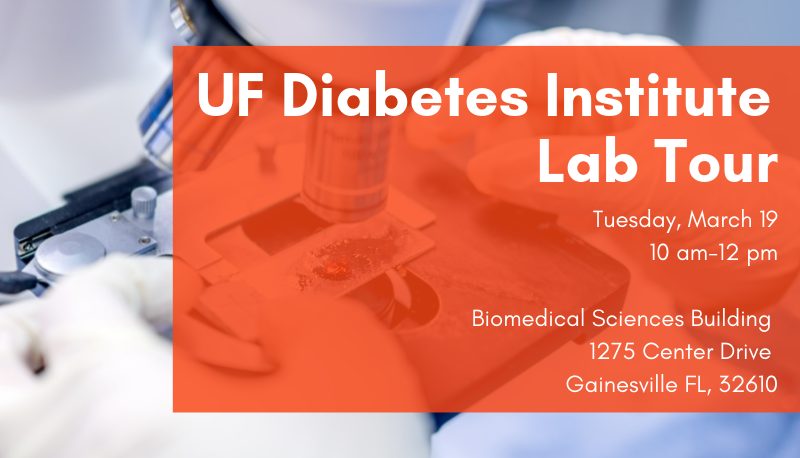 Are you interested in learning about groundbreaking research taking place at the UF Diabetes Institute? At the UF Diabetes Institute, researchers are asking questions to advance knowledge and understanding of diabetes through collaboration. Our people are conducting basic research to clarify the mechanisms causing diabetes and related complications, and translational research to transform their research findings into clinical solutions. Join us for a lab tour on Tuesday, March 19 from 10 am – 12 pm in the Biomedical Sciences Building, located at 1275 Center Drive, Gainesville, FL 32610. Please complete one form for each member of your group who would like to attend the UF Diabetes Institute Lab Tour.